No sooner fixed than in the field! This combo of little riding mower and old snowmobile trailer is possibly my favorite tiny farming tool, a decadent* alternative to walking up and down the garden plot. Anyhow, after trying a couple of different garden utility belts, overalls with 50 pockets, and a pull-along garden cart, nothing has come close to being able to toss all the stuff you need onto the trailer and go. I use it whenever there’s too much to carry. 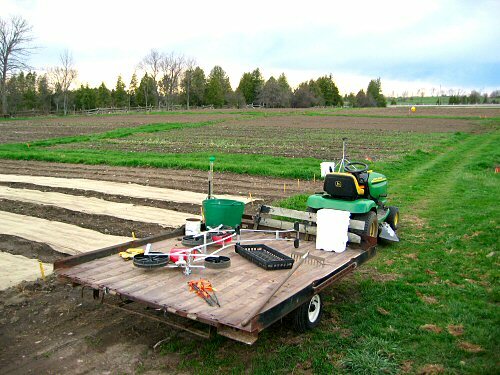 Here, I’ve just finished the second seeding of mesclun and spinach, four beds each (on the trailer: Earthway seeders with plates in the coffee can, my most used rake, measuring tape and stakes for marking new beds, a pail for rocks, and seed in the green trug; the empty trays just happen to be there). Up until I took this pic, it was a gloriously sunny day, after three days or so of cloud and drizzle (which added up to 20cm of rain). Little luxuries. *The mower is actually pretty energy efficient: it uses maybe 30 gallons (114 l) of gas in an entire season, and that includes mowing paths and hauling harvests.